One last picture of the eight of us before I call it a night of blogging. Hey, I’ve got a page full of other tasks I’ve got to get cracking on! Can you believe it’s another picture of us at sunset. 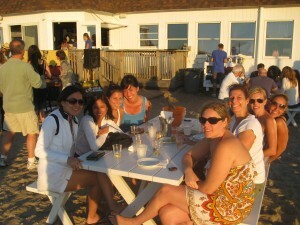 But this time we’re at the Montauk Yacht Club. Another band is playing in the background. Yahoo, life doesn’t get any better.